Man, these balls used to be the stuff. If you knock the stuff out of it, the drive might wind up 270 out. I really miss these balls, you truly exerience a different style of golf with wound as compared to the Pro V. I wish they still made these. Hot dang dinglying dang these things are nice. Cold day? You've gotta have that tour balata 90 if you're going to enjoy thinning the ball with blades. There's no other ball quite like it, although I'm a big fan of the Callaway HX blue which I find almost as soft. This ball is a bit outdated now, but it's still the best short-game ball ever made. If you play on cheap municipal courses with hard, bermuda greens you will love this ball. It would spin back if it landed on ice! Problem is, it's not durable at all and will cut & scuff very easily. My old man had a pack of these in his garage and handed me them last week. I decided to play with them the next day and I couldnt believe I had forgotton how soft these balls were. Before the Pro V1 this used to be the ball I played. No wonder I thought the Pro V1 felt like a brick when it first came out because the Tour Balata feels like putty. The feel from around the greens is unreal and the back spin theses balls generate is remarkable. I hit an 100 yard shot with my new Vokey Spin wedge and the ball landed up the back of the green and must have spun back about 25 feet. However when I got to the green and pick up the ball, the cover was ripped to pieces. Yip the Tour Balata's are not very durable at all. I was also hitting it about 10-12 yards shorter than the Pro-V1. However for spin and fell the Pro-V1 is no match for the Tour Balata. Still use these balls occasionally , I pull out the persimmon driver and fairway persimmons. The balls feel great and spin like a top. Downside is what most players call a smile from hitting it low on the equator. That's not a smile , turn the ball over and you will see that the ball is VERY sad. Play this ball on a warm sunny day and have some fun with the old persimmon and wound ball feel. This is without the best short game ball ever made. For shots from 100 in the performance of this ball is unsurpassed. It can be worked with the short irons in any way you can imagine. High, low, fades, draws, backing it up, stopping it on a dime is a breeze with one of these. Absolutely pure feel off the clubface, still the sweetest feeling in golf. Also great to putt with, roll and feeling is pure. Downside is usual downside of wound, balata golf balls i.e. they go out of round easily and smile at you if you hit them thin. Also not great for distance and accuracy with todays modern drivers. These balls are for skilled golfers who can work their drives, not for guys who want to bomb it straight with huge headed drivers that hit with less spin. Off the irons, particularly forged blades, these balls are still great and go as far as new balls, but can be worked alot easier. 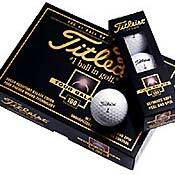 In the hands of a truly skilled golfer (which is not me) these would still be one of the best balls out there. A shame they don't make them anymore, I still think ther's a place for them in the modern game. I have played many different golf balls since I began playing golf. I hit the ball far and have decent control with my irons. This ball is the BEST ball to putt. It is also the BEST ball 100 yards and in. You will get more distance off the tee with other "soft" feeling golf balls but if your short game is where you want the best performance you can buy, I HIGHLY recommend these balls. Titleist professional 100's, strata tour 100, Nike precision tw, Nike precision, slazanger balata, precept, maxfli, and a bunch of others. I found one of these balls in the thick stuff while looking for my ball. I started playing the ball and wow! I got great straight distance off of my driver, and yet it had supurb spin with my wedges. It's one of the best balls I ever played. The only problem is that a couple weeks later I lost the ball when I sliced it deep into the woods (my fault, not the ball's). I looked around to see where I could buy some but apparently they aren't being made anymore because I couldn't find them anywhere. I might just go on a little hiking trip in the woods next to the course I lost it on. Maybe I'll even find a few Pro V1s in there. Wild ball! All the reviews are correct when they talk about spin. If you don't know how to spin it and control it, you'll find more trouble than help with this ball. Also, If you generate lots of club head speed, avoid this one. I hit 330 on my drives when I don't fade, well off the range at most driving ranges, this ball will deform to the point where it will hop on every revolution on the putting surface. After only one drive! I haven't had the problems with cutting and scuffing that others have described but it is probably because I hit all my high irons pretty thick. I have no idea how Tiger and the others avoid changing balls on the putting surface when they notice the ball is out of round... it really distracts me. One really good use for this ball however, is in the early spring or late fall when the temp is low. I've found it hard to spin well with anything at 45 degrees except this ball. It's really nice then.